Microcontroller Arduino Project Simple Monitoring System ECG. In this time we will discuss about Arduino Project.In arduino project we will try to use ECG with microcontroller arduino. Project arduino in this article will show heart beat in computer with serial communication. this project will give you base example, how to use ECG with arduino. So, you can implementation this article to finish your project where use ECG with arduino. An ECG Sensor with disposable electrodes attaches directly to the chest to detect every heart beat. The electrodes of ecg sensor will conversion heart beat to electric signal. ECG Sensors is very light weight, slim and accurately to measures continuous heart beat and give rate data of heart beat. This device always use by trained doctor and medical assistances. Electrodes of ECG Sensor have 3 pins and connected by cable with 30 inches in length. It is make ECG sensor easy to conected with controller and placed at the waist or pocket. In additional, the plug-in for the cable is a male sound plug which will make the cable to easily removed or inserted in to the amplifier board. The sensor assambled on an arm pulse and a leg pulse. All of every sensor electrodes have methods to assemble in body. So, training and tutorials are needed for user. You can choose type of electrode to measure heart beat. 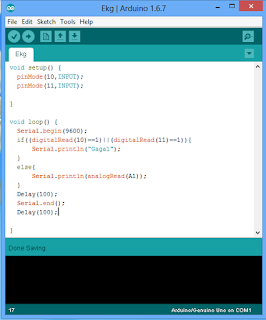 Arduino Editor and compiler (If you don't have you can download in https://www.arduino.cc/en/Main/Software). You can choose editor depent of your operating system. In arduino site, when article was made, there are three arduino editor for three operating system i.e WINDOWS, MAC OS and LINUX. Don't forget to choose editor in accordance with the operating system and bit of operating systems(32-bit or 64-bit). ECG EKG electrode Sensor which connected with cable can assemble directly plug in to the board of AD8232. At AD8232 board have 6 pins which can be connected to arduino uno or mikrokontroller. In this project we will use arduino as controller. The AD8232 is a based module with cost-effective board where used to measure activity of the heart with electrical signal. This electrical device will detect activity of heart which can be converted as an ECG or Electrocardiogram and maked output as an analog reading. The AD8232 Single Lead Heart Rate Monitor works as an op amp to assist obtain a clear signal from the PR and QT Intervals easily. The AD8232 is a system project board of electronics with integrated signal conditioning block for ECG with applications for biopotential measurement . 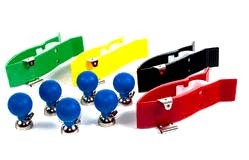 It is designed to amplify, extract and filter all of small biopotential signals from noisy conditions, such as those created by movement or action of electrode placement. 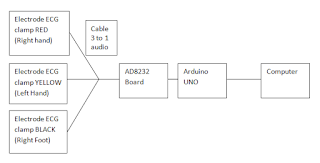 In this project I will use arduino uno as controller in the project system. Arduino uno in this project have function as ADC Converter. So that, ADC will read data from AD8232 send data to computer use serial communication and data will show in computer. Before we starts to make program arduino advisable we must know about ECG. The figure above display of standard one cycle ECG signal from a heart beat. 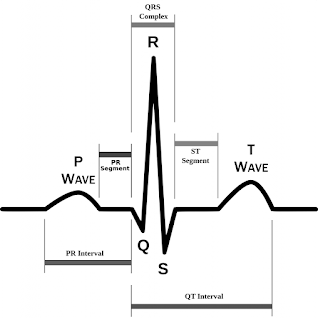 From the figure one cycle consist of P wave, QRS wave until T wave. P wave offers benefit information about the propagation time of the impulse to both atria. Then, follow with a flat trend called with the PR segment which is in consequence of propagation of the electric impulse from atria to ventricles. And follow with QRS complex wave which you can look in above figure. Q,R and S complex contains of three small wave i.e small Q wave, the high R wave and the small S wave. 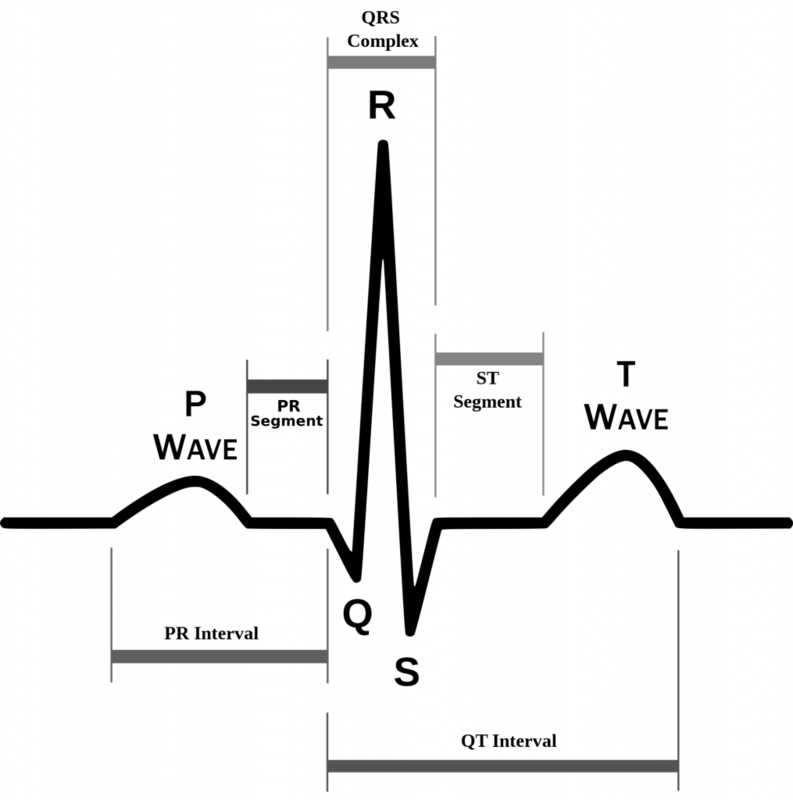 The QRS complex give information about the ventricular systole in consequence of the impulse propagation to the ventricles (Q wave), whereas the transmission to the whole tissue is caused by the R and S wave. The QRS complex provides information about fibbrillations and arrhythmias, it can be helpful to analyze heart attacks. And then ST interval, it is following by the S wave and including with the T wave, it can point out the ischemia occurances. It represents the period during which ventricles are contracting, which is the last stage of the heart cycle. The T wave permits one to have information about the cardiac hypertrophy, heart attacks, and ischemia. Moreover, others parameters, such as the QT interval, allow soecific further pathologies to be characterized. Finally, the ECG signal ended with a small peak, U wave. From the ECG parameters, analysis a Heart Rate Variability (HRV) of the ECG signal can be implemented. According to the parameters changes comparing to the normal parameters above, the system may predict which disease that the user potentially suffering from. 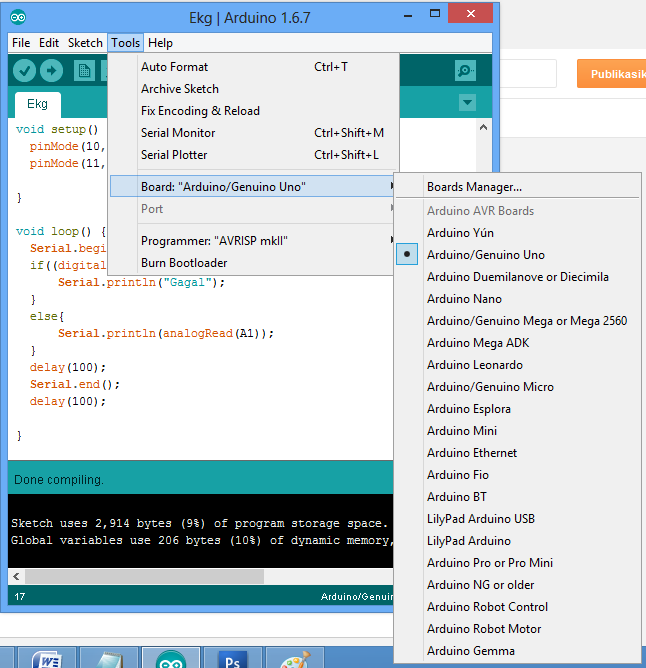 Arduino Editor and compiler compatible for windows 7 32-bit. Make sure all of the requirements are installed appropriate with figure project. In figure, 3 three electrodes clamp connect to cable EKG. EKG cable connect to AD8232 board with 3.5 mm audio jack. Connect with cable board AD8232 to arduino like table AD8232 to arduino.Connect Arduino to computer with cable serial. Void setup is a function that was first executed. So, Usually a programmer arduino use this function to initials input, output device with putting initial the device which is connected to arduino like input output device. void loop is a function that was executed repeatedly. Usually a programmer arduino use this function to make proccess programming or we can call core of programming. In arduino coding, we must we must pay attention to uppercase and lowercase or we can call arduino program case sensitive. Send message "Gagal" to serial communication. 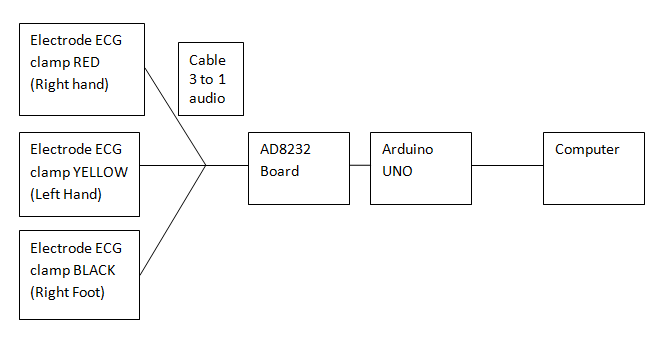 Close serial communication between arduino and computer.